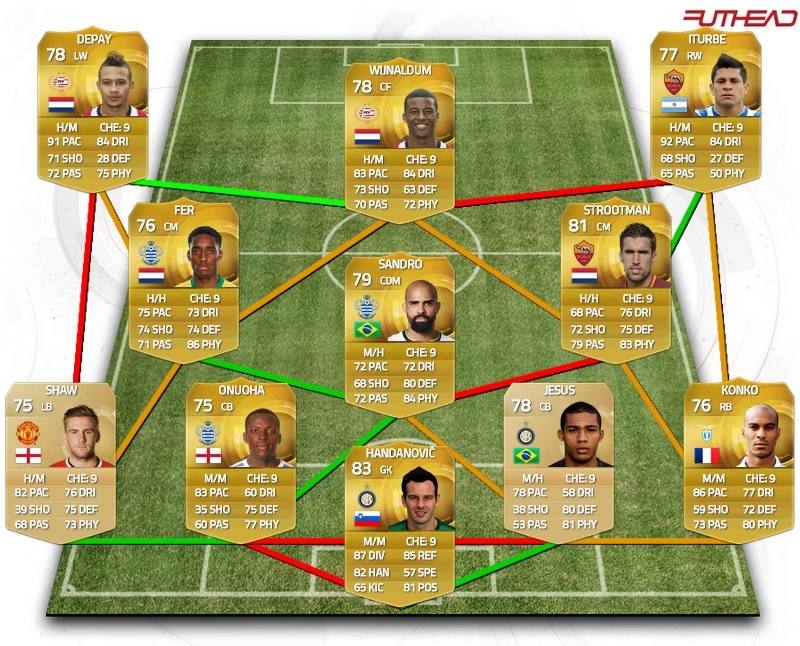 It’s time for a new Squad Builder for FIFA 15 Ultimate Team again! This time, it’s all about fitness, a skill that is useful for your second squad! They can play when your first squad is tired, but still have a high level of performance. The most useful player in this squad is in my opinion Memphis Depay, but I’ll break down this squad player by player. Samir Handanovic: The goalkeeper of Internazionale and the Slovenian national team is our highest rated player in this squad. He costs around 1.600 coins, but for that amount you’ll get a pretty decent goalkeeper. His best stat is his Diving (87), followed by his Reflexes (85). He was famous for his two IF’s in FIFA 14, but still received a downgrade by EA. His current overall rating lies at 83. Luke Shaw: The talent of Manchester United, who came from Southampton, is our Left-back in this squad. He is the lowest rated player in this squad, with only a rating of 75, but he still has a great pace. His price lies around the 500 coins, which is really cheap for him. Feel free to try him out in this squad and you’ll notice that he is a good player! Nedum Onuoha: This player is a real beast! The central defender of QPR has 89 Sprint Speed and 84 Strength, which makes him very useful in a Fitness Squad like this one. His price of 1.200 coins is not really high for a player, but notice that he is only 75 rated and he doens’t have really good defending stats. Juan Jesus: This second non-rare defender is a player of Internazionale, just like Handanovic. He is a really strong defender with 90 Jumping, so you can defend the corners of the opponent easily. His price is only 600 coins, which is cheap for a player with 82 Standing Tackle, 84 Agression and Strength. Abdoulay Konko: The player with the great first name is the Right-back in our team. He is known for his nice Sprint Speed (87) and Acceleration (84), so he definitely deserves a place in this squad! He plays for Lazio, so he forms a good link with our other players on the right wing! You can buy him for 1.400 coins, an average price for this 76 rated defender. Leroy Fer: I prefer to call him ‘The Tank’, because of his amazing Stamina (91) and workrates (high/high). His great stats are his Strength (87), his Heading Accuracy (83) and Shot Power (84). One of his traits is also ‘Power Header’, so this makes him pretty useful in an attacking corner! You can buy him for only 1.200 coins, take a shot! Sandro: This strong midfielder of QPR with his amazing beard is the most central man in our squad. He is a defending midfielder, which makes him useful in our attacking squad. Buy him for only 850 coins and you’ll get a 79 rated player with high defending stats! Kevin Strootman: The second Dutch midfielder of this squad, a player for AS Roma. He is in my opinion a real beast, if you look at his workrates and other stats. Many FIFA players think about his rating of 81 as underrated, which gives a statement to EA. Try this guy out for around the 1.000 coins! Memphis Depay: In my opinion the best player of this squad, due to his amazing pace, ball control and skills! He announced himself on the previous WC, where he played some stunning performances for the Dutch national squad. He is still playing for PSV, but I think that he will move to a (sub)top team during the summer period! Buy him for only 1.500, he is really worth his money! Georginio Wijnaldum: Our central forward is Wijnaldum, also playing for PSV, and he has some pretty decent Physical stats. Almost everyone of them is above the 80, except for his strength (68)… This is really a shame, but in this squad you’ll use him as a creative attacker, who creates the chances for Depay and Iturbe, maybe even for Fer with his amazing shot. Buy Wijnaldum for 850 coins! Juan Manuel Iturbe: Last, but, definitely not least! This pacewhore of AS Roma is in my opinion the second best player of this squad. His pace combined with skills and dribbling makes him one hell of a scoring weapon on the right side. Feel free to try this guy out for 950 coins, you’ll get a 77 rated talent for that! What do you think of this squad? Let us know in the comments down below! So if I have 2 squads, will the players’ fitness improve in one squad while I play with my other squad?